It's well done with a good story but I've seen better which is why I only gave it a 4 star rating. I loved movie, it really moved my heart, It shows that you can change no matter what. and a heart can be mended. This movie is about a bitter, despondent young widow who blamed God when her husband was killed in Afghanistan, and how her attitude affected those around her, especially her daughter. It was only after she lost her home and almost lost her daughter that she began to heal and turned back to God. Excellent! The movie is well acted and filmed. It is a real to life movie of serious struggles where the viewer can definitely relate to the characters. I highly recommend this movie especially to those struggling with their faith in God! This is definitely a Five Star movie. Gripping, totally true to life and exceptionally uplifting and encouraging. A must see movie. Very real and true to life. God is good and His way may not seem right at the time, He knows the future. I loved "God Bless The Broken Road". It was awesome. I'd see it again. Will buy the DVD. Awesome story. Shows how difficult life can be and yet there is always hope when God is part of the picture. This is a wonderful movie! A must be seen by you. 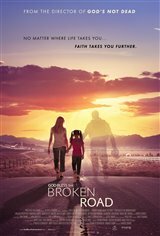 Everyone can identify with the plot of the story...All of us has its own broken road but what a great comfort the movie is reminding us that God in His own perfect timing will make all things beautiful. Indeed if you don’t have the living hope in God life will be miserable! The cast did a wonderful job of playing their part. God bless! It was a Great Movie!! It shows how God never gives up on us, even though we walk away from Him! What a Great reminder how much God Loves us!! My husband & I we sow the movie las night, it was a beautiful realistic movie, unfortunately it broke our hearts, we were the only ones in theater watching it all seats were empty and nobody alse, we notice the christians and not christians were not interested in this kind the movies how God works on our lives, instead all the theaters were show action and terror movies were all fill up wiht young and older people it was sad to see but it shows the Times we live in, the bible said on Mateo 24:12 Because of the increase of wickendness the live of most will grow cold. What an awesome story! Just helps remind of how God never lets go, never stops loving and caring for us even when we give up on Him! So blessed! Overhyped nonsense. Characters are essentially one-dimensional wooden pawns who simply aren't believable. The director was clearly trying to deliver vast expanse and too much emotion. Avoid this film. Originally found out about this on the faithfilms.ca site. Great story about how someone loses faith in God when something horrible happens to them, and how it can be restored. Faith is not something that can easily be explained, and this film is not interested in converting anyone. Not overly heavy handed when it comes to preaching a message, so something wholesome that the entire family can see. Beautiful movie about finding God's Love in times of loss, when it can be hardest to understand, and bring the most comfort. Really inspiring, I enjoyed it.